Different apps, fads, and ways of communication may come and go. There’s a reason that fax machines are all but extinct and pagers have become a thing of the past. But the one thing that has remained true for the past 20 plus years is that email is an incredibly effective way to get in touch with and market to your customers. And before we go any further, I’d like to dispel two myths off the bat. One, email is not dead. It never has been, and probably never will be. Two, millennials love email. In fact, they are more likely to take action from a relevant email than any other age group. The right email marketing strategy can help you build a beloved brand, drive initial and repeat sales, and recover more abandoned carts – making it critical to the success of your ecommerce business. And it's a very cost effective marketing channel, to boot. Let’s talk about 5 types of emails that you should be sending throughout your customer’s journey. Capturing your shopper's email through onsite displays turns them from complete strangers to subscribers. Once you have that information, your welcome email is like your first audition in turning that subscriber into a lifetime customer. 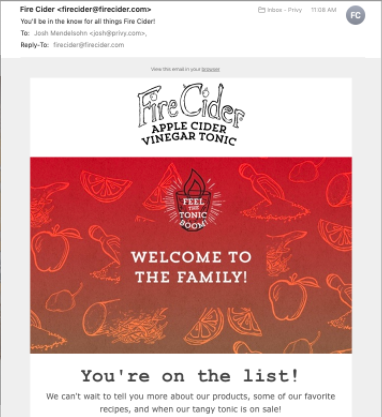 In the example above, you'll notice a very branded email from Fire Cider that welcomes their new subscriber to their email list with warm messaging - "welcome to the family" - and ensures them they'll be the first to hear about new products and upcoming sales. Have a subscriber who continues to visit your site without making a purchase? Send an automated email reminding them about your offering or include a discount encouraging them to make a first purchase. In a recent survey we sent out, 72% of merchants identified cart abandonment as one of their top challenges. And it just so happens that email is one of the most effective ways to combat that challenge (cart savers are awesome, too!). In fact, data from Salesforce confirms that while the average revenue for promotional emails is $0.02 and welcome emails is $0.18, the average revenue for abandoned cart emails is $5.64. Whoa. That's an opportunity you don't want to miss out on. 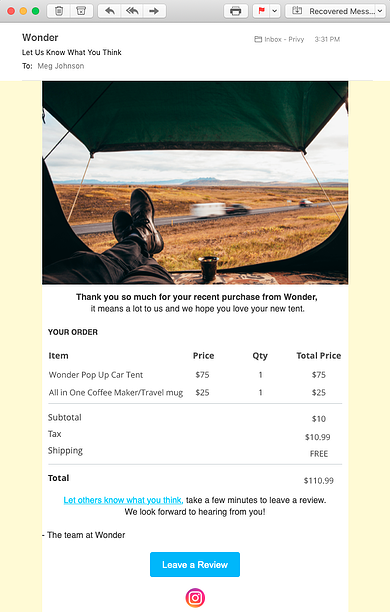 Make sure to send emails to people who have left your site with items in their cart without making a purchase. You may be asking yourself, "when should I be sending these emails?" or "how many emails should I be sending?" Great questions. 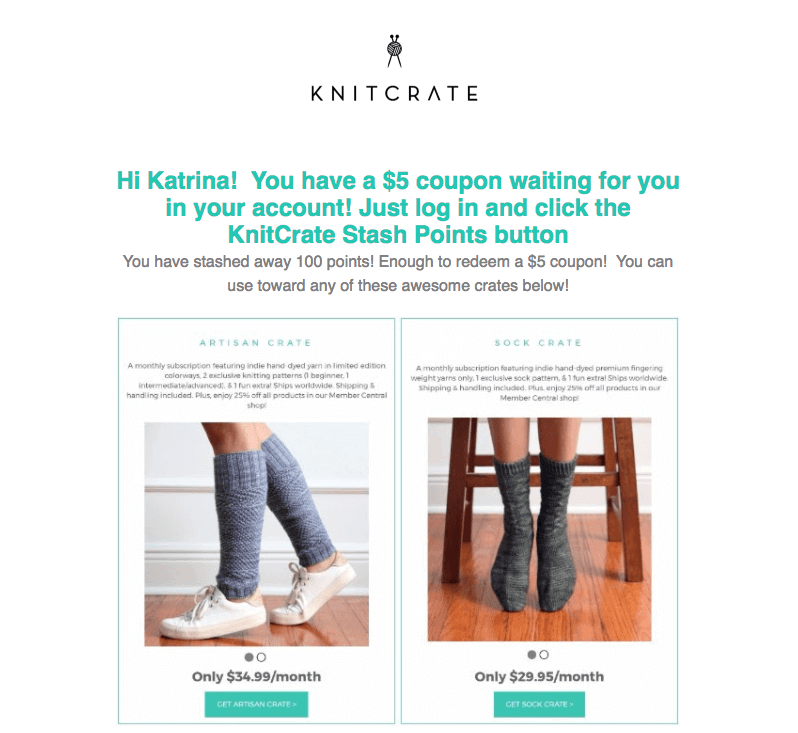 Check out our post on How to Build a Powerful Cart Abandonment Email Series. A customer just made a purchase. Score! Now, it's time to send a branded order follow up email to not only confirm their purchase, but also thank them for shopping with you. Even though this customer has already completed a purchase, this is another touchpoint in the customer journey to solidify a great impression. Your goal is to turn them into a loyal customer, right? In addition to confirming order contents, you can also use this time to encourage a customer review (like the example above) or another purchase by highlighting other items from your store. Most merchants spend tons of time and money acquiring new customers via paid advertising, search engine optimization, and on and on. But once a customer makes a purchase, you already have a foot in the door. That's why repeat customers are so critical to the success of your business. Your loyal customers not only make multiple purchases, but they tell their friends and family, and even share your sales or promotions on social media. 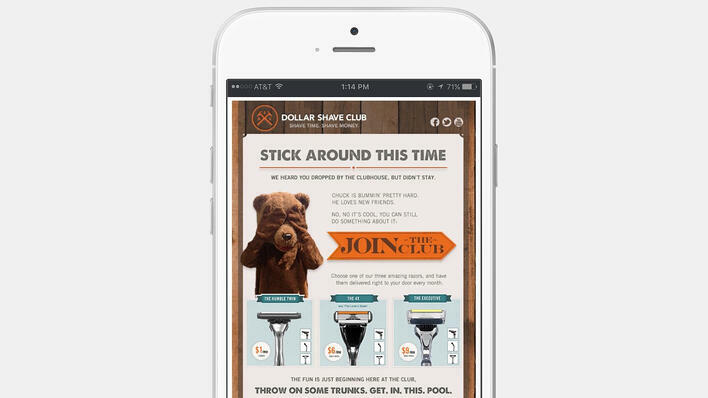 Send your most loyal customers (based on a certain order count or order value) an offer they can't refuse. This could be a special discount or letting them be the first to know about an upcoming sale. What about those customers who have successfully made a purchase from you before, but then... crickets. For this audience segment, send them an offer to reengage them and drive them to make another purchase. Keep in mind the lifecycle of your product. 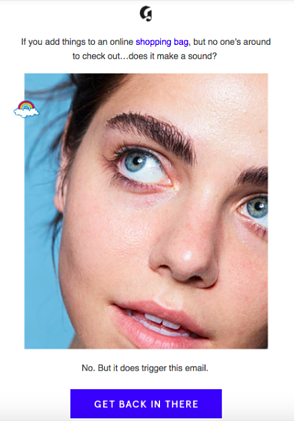 For example, if you sell makeup and you know your products typically last a few months you may want to wait until that timeframe (say, 120 days) to trigger an email to bring them back. 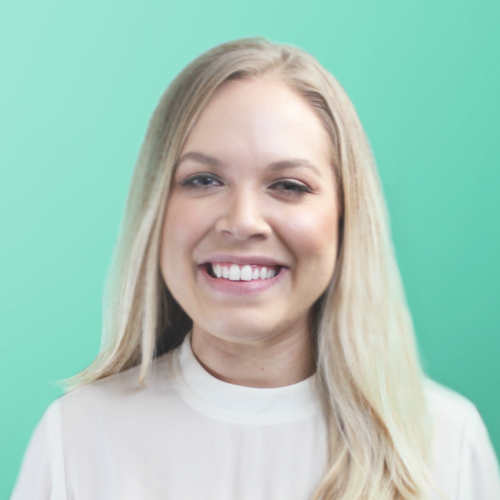 Want to learn more about email marketing with Privy?